PODCAST 199 IS ONE NUMBER AWAY FROM PODCAST 198! Hey guys! It's time for the 199th podcast! In it, we talk about all the rad stuff that's going on with us lately! Things like... Game Days at Disneyland! 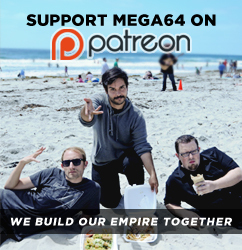 A brand new shirt in the Mega64 Store!Â We also just put up a video for the new Ghost Recon! That plus you can watch me have a conversation with my friends for a hour! So I guess the question you have to ask yourself is...Are you in?Â Listen to the audio version here! That's all for now we hope to see all of you at Game Days next Sunday! We will be there rain or shine! See you then!